A few reflections on last week’s ESA meeting, more notes to myself than anything. Brian, Meghan, and I are off to #ESA2017; please say hi to us! p.s. See here and here for advice on the whys and hows of networking at conferences. And here’s Meghan on wandering alone at conferences and Stephen Heard on conferencing as an introvert. Here are your ESA bingo cards! I love the ESA meeting, and for me part of loving the ESA meeting is having a chuckle about it. Hope these cards will give you a laugh too. I am excited to welcome you to my home town and home state. The state, Oregon, has not changed much since I lived there 30 years ago. Most people’s dominant impression of Oregon is very tall, very green trees. But in fact it contains biomes ranging from cold desert to temperate rainforest and includes grasslands, oak woodlands, alpine tundra and several forest biomes. It also includes elevations ranging from a rugged rocky coastline to half a dozen permanently glaciated peaks over 3000m (most of which are active volcanoes) (and has 3 distinct mountain ranges). Portland has changed a lot more in those 30 years. It remains a laid-back, outdoor-oriented, tolerant, Bohemian, funky city. But it is more self-consciously precious (as satirized in Portlandia) and is way more crowded than when I was a kid and the traffic is now terrible. The Willamette Valley (which includes Portland) at this time of year can have highs anywhere between 85º-100 º F (roughly 30-40 ºC). It will typically be fairly dry though, and despite the reputation for rain, from July-September rain is quite unlikely (the weather blows in from the desert to the east). The coordinate center of Portland is the Burnside bridge. East is divided from West by the Willamette river (which runs roughly north-south and rhymes with “dammit”). And North is divided from South by Burnside St, a major street that runs east-west. So downtown Portland which is south of Burnside and west of the river is in SW (southwest) Portland. The convention center is in NE Portland (although both downtown and the convention center are very close to the coordinate origin and so each other). Numbered avenues run north-south on both sides of the river, starting with 1st Ave closest to the river and increasing in numbers away from the river. The streets north of Burnside follow the alphabet – so Burnside, Couch (pronounced “Kooch”, not like a sofa), Davis, Everett, Flanders, Glisan (prounced “gleason”), Hoyt, Irving and so-on. South of Burnside it is not so logical – you will find names like Taylor, Alder, Salmon, Yamhill, Jefferson, Madison (a mix of presidents and local place names). The convention center is at effectively NE 3rd and Irving. So if you find yourself at NW Everett St and 5th Avenue, you know you have about 8 blocks to walk east and four blocks north. Very approximately and only near the center of town, there are about 20 blocks to the mile or 12 blocks to the kilometer (but google it – don’t blame me if something is further than this suggests). So in the latter case of 12 blocks to walk you would have about 0.6 miles or 1 kilometer to go. There are a few exceptions. On the west side, 7th avenue is named Broadway. And of course some of the biggest exceptions are right around the convention center. The convention center is basically at NE 3rd and Iving (I street). So just to the east of the convention center should be east 4th and 5th avenue but they are called Martin Luther King (MLK) Ave and Grant Ave respectively. And the streets to the north of the convention center should be the L & M streets (Lovejoy & Marshall) but they are called Holladay & Multnomah. But if you get at all south or west of the convention center where all the food is, everything is regular. In particular you should be able to walk across the Steel bridge (use a map or GPS the first time as the freeways make walking to the bridge a bit convoluted) and you will be right at NW 1st Ave and Glisan street and everything south and west of there is well-behaved. If you want to go running I would recommend Waterfront park (on the west bank of the Willimette – i.e. between W 1st Ave and the river) from NW Glisan to SW Clay. Or run uphill from downtown to 23rd and either Jefferson or Burnside (SW) to enter Washington Park with numerous trails up into the hills. Or take SW 6th Ave south until it turns into Terwilliger Ave, a tree-lined parkway with a wide sidewalk which winds up into the hills. You can get to lots of good places if you are willing to walk a couple of miles round trip. If you don’t have time or energy, you will want to use public transportation. Similarly if your hotel is downtown rather than at the convention center, you can walk or take public transportation the mile or so to the convention center. Public transportation is generally excellent in Portland and comes in three flavors. Max is the light-rail, Portland Streetcar is the trolley cars, and the buses just go by the name TriMet. Max is your best bet between the convention center and core areas near the river. The streetcars run around the periphery a little bit but may be useful if you want to go further out in the Pearl district. Both Max and streetcars run right by the convention center. You can do almost anything on the buses too but simpler to stick to the street cars and light rail. Both Max and streetcars (unlike the buses) operate on the honor system (i.e. nobody checks if you have a valid ticket, you just walk on, but occasionally inspectors will board asking for proof and hand you an expensive fine if you don’t have a valid ticket). A key change from the last time ESA was in Portland is the free zone has been eliminated. In 2012 you could hop on a Max downtown and ride to the convention center for free. This is no longer true! Because they work on the honor system, if you didn’t know you could hop on for half the week thinking the free zone still existed without being challenged, and then end up with an expensive fine. As far as fares, the best choices are to buy a ticket for one day (from machines on the platform or train), or buy a 7 day ticket (from the same sources). There is also a 5 day “book of tickets” but: a) it only costs $1 less than 7 day, b) the tickets are not validated when you buy them, you have to put one in a validation machine on the platform or train when you first start using it or it isn’t valid, and c) they’re only available at convenience stores, not the trains or platforms. There are also available one-way and round-trip tickets, but the one-day tickets seem more cost effective. So my recommendation is one day tickets ($5) or 7 day tickets ($26) The Max ticket also works on the streetcars. 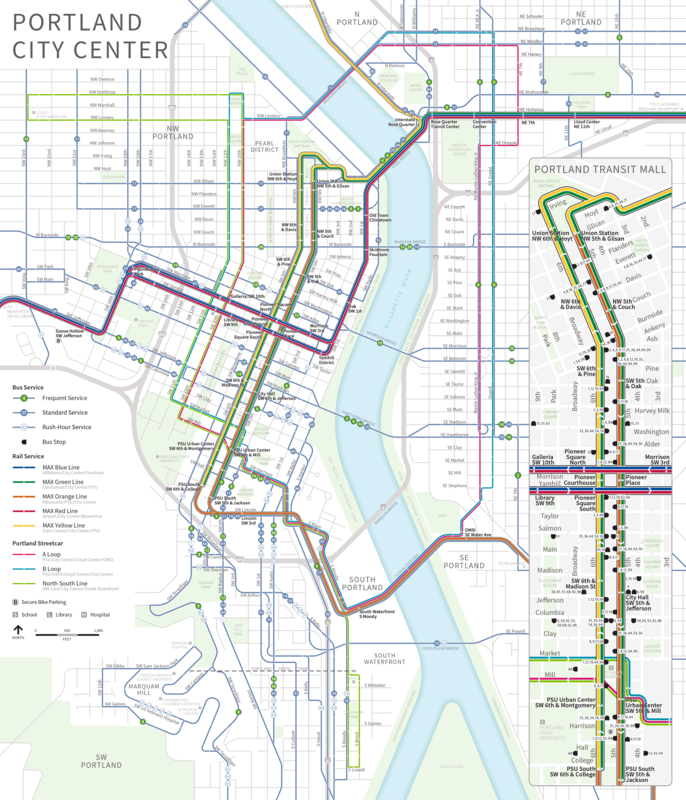 You can find a convenient map of all the public transit in the core area to print out before you leave home or download to your phone at https://trimet.org/maps/img/citycenter.png or use their trip planner. You can take the Max red line from the airport to the convention center or to downtown where the hotels are. Portland is justifiably considered one of the roots of the microbrewery movement (there were going concerns over 30 years ago). So I’m not going to particularly specify where to find good drinks. You can find them almost anywhere. Every restaurant will have several local beers on tap. And there are many microbrewers around. I believe this might have something to do with the popularity of Portland for ESA conventions 🙂 (Jeremy adds: check out yesterday’s beer geek’s guide to Portland!) Oregon is also becoming increasingly well-known for its wines (and this will only improve; climate change is going to move California’s Napa valley to the Willamette valley over the next 50-80 years). So similarly, you can find plenty of good local wines on every menu. Oregon specialties include the Pinots (Pinot noir, Pinot gris, Pinot rose) and Chardonnays (but no need to reject the local Riesling, Syrah, Cabernet, Zinfandel, Merlot, Gewurztraminer, bubblies, etc.). If you are really serious about wines, you will want to rent a car and drive west of Portland on 99W (heading out from highway 217). In under an hour you will drive past over a dozen wineries with local tasting shops. Around the convention center – very sparse for eating and drinking. A few specific suggestions below but that is a high fraction of what is available. But by and large you’re better to walk a mile/hop on the Max to the west-side (across the river). Lloyd Center – one of the nation’s first shopping malls (still contains an active year-round ice skating rink). Head out of the convention center on the north east side of the center, and head east on Holladay St and one more block north to Multnomah St. You will be rewarded with typical mall restaurants. There are some sit down restaurants in the mall. And there is a large food court (a dozen or so fast-food-ish restuarants ranging from the McDonalds to fast-food Mexican, Chinese, etc.). The main virtue is this is a quick way to get a group fed for lunch without having to debate where to go for half an hour in advance (I’m sure regular conference goers have never had this happen to them!). Nothing special about the food, but they are accustomed to serving the business crowd and getting people in and out for lunch. Holladay Park is a block south of the Lloyd Center if you want to grab food from the food court and then eat it outside. Four years ago there was a crepe food truck in the park, but I can’t find any evidence of that now – might be worth checking out though. Easily walkable about ½ mile one way, or take the red, green or blue Max lines east two stops (Lloyd Center) and then walk north a block (the food court is on the 2nd floor). Probably quickest option for lunch short of buying in the convention center or going to fast food immediately around the convention center. Old Town (NW between 1st and 3rd Avenues and Burnside and roughly Irving Streets) – mix of shopping and restaurants. Was the hippest area a decade or two ago so a bit more establishment now. Still plenty of good restaurants and very close to the convention center. Walk across Steel Bridge and head south or take the blue or red max lines south from the convention center. So be bold. Explore. But to get you started here a few restaurants organized by neighborhood. Not living in Portland anymore and Portland having a very active food scene, these recommendations are courtesy of my sister, Amy, who lives in Portland (although I have been to about half of these). Warning many of these are very popular restaurants and probably need reservations or a willingness to wait. Powell’s Book Store – 10th and Burnside (blue street car or yellow/green Max 6th & Pine stop) – Imagine an entire city block with 15 foot high ceilings (used to be a car dealership). Now imagine that entire city block filled with bookshelves 10 feet high mixing new and used books on every topic under the sun. Then imagine that continuing up for three floors. It is the world’s largest independent bookstore. If you want technical ecology books stick to the vendor displays at the convention center, but if you want anything else, head here. Grab a map when you enter so you can find the book sections you want. The science fiction and mystery sections are each bigger than some whole bookstores (now you know what kind of books I read). The kid to young adult book section is about 1/3 of a city block. Open until 11 every night so you can stop by after dinner if you want. Washington Park – roughly SW 23rd and Jefferson (walkable – about two miles from the convention center or one mile from downtown hotels – but may want to look into public transportation) – contains a Japanese garden and a rose test garden (varieties from all over the world planted to see how they do here). Both are far enough up the hill that you will have spectacular views back east over the city and Mount Hood. The outdoor amphitheater (bring a picnic) has programs every night Aug 1-10. Further up in the park (you will need to think about transportation) is an arboretum and a zoo. And even further is Forest Park – one of the largest urban forests in the US – 20 miles of trails through mostly old growth forest (the hills were too steep to cut). Tryon Creek Park – one of the only state parks within urban city boundaries in the US. Probably need to take a taxi or the 38 bus. Good biking or running trails. At the far end of Terwilliger that I mentioned above for running if you’re looking for a really long run. Lots of guided and interpreted trails for hikes. Good place to get introduced to the ecosystem native to the Willamette valley that has been almost completely eliminated by farming and cities. Could easily spend a long afternoon here. And pick a lot of blackberries to eat. Oregon Museum of Science and Industry (OMSI) – a good, fun science and technology museum. Not on a par with Chicago or the Smithsonian of course. But any nerd could happily spend half a day or more here. It does a nice job of being interactive without dumbing down the science. It is in SE, so take the streetcars; take the red line to get there, getting off at the OMSI stop, then the blue line back. Columbia River Gorge – for a fun day trip, head east up the Columbia River. As it passes through the Cascade Mountains, the river banks narrow to a steep walled gorge. There are many hiking trails and spectacular water falls. Rooster Rock State park is also a popular beach (including one of only two legally clothing optional areas in a state park in the country – that’s Portland for you – although not on the main beaches). Further up river is Bonneville Dam (and its salmon ladders) and the town Hood River (supposedly the windsurfing capital of the world – the winds narrow down to pass through the gorge). If you’re in a hurry take Interstate 84. For a more scenic trip, take the historic Columbia River Highway. By far the most popular destination is Multnomah Falls. But its almost always overcrowded (in ESA 2012 I went on a Friday morning and it was still mobbed). There are several other smaller falls (Bridal Veil, Horsetail) with parking and trails that interconnect with the top of Multnomah Falls and almost nobody goes to them. Park there, enjoy one fall and then take a few mile hike to Multnomah. Mount Hood/Timberline Lodge – just an hour east of Portland you can reach the treeline (about 6000 feet) and a massive, lovely lodge built by craftsmen hired during the Great Depression to put them back to work. There are plenty of trails and two restaurant options. Summer is short up here so the wildflowers are usually great. A ski-lift over a kilometer long makes summer skiing on the glacier possible. People in their 70s in tennis shoes have climbed to the top (11,245 feet) in the summer months but it is definitely not recommended – the upper slopes are a technical climb with an active volcanic fumarole, snow arrette, crevasses, and a narrow ice canyon with rocks melting out and rolling down in the summer and plenty of well prepared people have died on this mountain too. But if you stay below the top of the ski lift at 8500′ you’re fine – just be prepared to hike in snow if you go above about 7000′ – stay on the horizontal trails at 6000′ otherwise) You can get here by public transportation with three switches. Oregon Coast – about two hours west of Portland (half of that due to traffic). The two main roads from Portland to the coast are Highway 26 which comes in at Canoyn Beach and Seaside and Highway 99W then 18 which comes in at Lincoln City. In my biased opinion the best and least touristy part of the coast (unless you go way south) lies between these two areas (which of course takes longer to get to, but its only another ½ hour to avoid massive crowds). Neskowin, Pacific City, Garibaldi, Cape Lookout and Tillamook are all rugged and not overcrowded. You could do a long day trip (or overnight trip), driving out 26, heading south on the coastal highway 101, stopping wherever, then heading back east to Portland on 18 then 99W (and stopping at some wineries on 99W). You can reach Seaside and points north by taking a bus from the train station (it’s how Amtrak reaches the coast). Mt St. Helens (about 1.5 hours north and you’ll need a car) – used to be the most symmetrical of the Cascade peaks and easily seen in Portland (Mt Hood is bigger and to the east while St Helens is to the north). But on May 18, 1980 (and yes everybody who was living in Portland then as I was still remembers that date) it literally blasted off about 1/3 of its top. It remains a very active volcano and you will occasionally see plumes coming out of it. It is now a national monument you can visit. It is too dangerous to go in the fumarole which has an again growing lava dome. But you can explore a landscape that was variously flattened or blowtorched by the explosion and see the awesome powers of recovery by Mother Nature. Many ecologists have made their name observing this unusual example of primary succession. Later this week Brian will provide a bunch of tips on where to eat and drink in Portland, including several brewpubs. Commenters on our Portland open thread also have great tips. But if you’re a beer geek like me, you’re not going to be happy drinking at whichever decent bar is closest to the convention center. I’d rather go a bit further afield to seek out someplace really good and hopefully also less crowded. So here are the fruits of my background research on beer geek websites like RateBeer, plus a bit of personal experience from the last time ESA was in Portland, plus the suggestions of commenter Brandon Cooper. Please do chime in with your own suggestions in the comments! Warning: I’m a beer geek, but a slightly atypical one: I don’t like IPAs. I go for English- and Belgian-style ales, wheat beers, bocks, and sours (aside: I was into sours many years before they became trendy, thank you very much). Also, I’m not a fan of really loud bars when I’m out drinking with friends (which is why Bailey’s Taproom and APEX aren’t listed below). My recommendations reflect my tastes. If you want to seek out crazy 100 IBU beers or rockin’ bars, you’re on your own. Here’s how I choose which presentations to see at the ESA meeting. How do you do it? Occasionally in the past readers have asked me to post the list of talks and posters I’m planning to see at the ESA meeting. I appreciate where such requests come from; there are a lot of talks and posters and I’m flattered that some people would like their favorite blogger to help them choose. But I’m a little uncomfortable with such requests. I choose which talks and posters to see for my own reasons, which are probably not (and shouldn’t be) your reasons. So rather than post the list of talks and posters I’m planning to see, here are some suggestions on how you can choose which ones you want to see. Please add your own suggestions in the comments! Evolution 2017 starts in in a couple of days, and #ESA2017 is coming up soon after that! We have a local lined up to write a guest post for us about where to eat and drink in Portland for #ESA2017, but in the meantime: been anywhere good? Tell us, and your many hungry and thirsty colleagues, in the comments! I’ll start: McMenamins Kennedy School is worth the car ride. It’s a historic elementary school that’s been converted into a boutique hotel and brewpub. My wife and I stayed there a few years ago. You have to see it to believe it, it’s such a cool place. Every nook and cranny is put to use. There are several bars, each with its own funky decor; even the boiler room is a (cozy) bar now. The auditorium is now a theater that features classic movies and live music. You can eat and drink outside in the courtyard in the center of the school. The walls are festooned with paintings from local artists, every one of which was commissioned to commemorate the school. And the classrooms are now hotel rooms–that still have the chalkboards and chalk. In the ultra-competitive world of Portland brewing, McMenamins beers are fine, nothing special. Same for the food–it’s average brewpub food. But you’re going for the setting. McMenamins has made a name for themselves with their amazing renovations of historic properties in and around Portland, but they really topped themselves with the Kennedy School. I took my lab group there last time the ESA was in Portland, and might do so again. Maybe I’ll see you there! Today at 10:20 am Central time I’m giving a keynote talk on science blogging at the 2016 American Fisheries Society meeting. It’s part of the #SocialFish symposium, which runs all day. Come on by if you’re at the meeting, or follow via Twitter if you’re not! It’ll be a mix of old thoughts and new thoughts. There will be zombie jokes. And I’ll be comparing myself to an alligator gar. Brian, Meg, and I all skipped the ESA meeting this year. So you tell us–how was it? What’s new and exciting in ecology this year? Below the fold: brief comments on choice of site. What are your favorite past sites? Where would you like to see ESA meet in future?